EdwardGibbonCenter.com is an independent noncommercial venture of site director S.W. Kolterman, M.A. History, Villanova University (Pennsylvania), USA. He briefly pursued doctoral studies, with a concentration in the Atlantic World 1500-1815 and much exposure to Prof. John Pocock's work. With respect to Pocock, this is an unofficial site; he has not endorsed this site and he has not been asked to do so. Earlier, now haphazardly edited, versions of our Decline and Fall, Chronology, and Miscellaneous Works pages appear on Wikipedia because at the time of their original compositions we were much less than fully aware of that source's reputation for chronic inaccuracy and its continuing vulnerability to vandalism. As of 25 May 2009 those articles are obsolete, and we accept no responsibility for their accuracy. These, from EdwardGibbonCenter.com undergo continual professional review and improvement. Reminder: in any and all shades of scholarly sense, Wikipedia must not be consulted for anything other than preliminary indications. To achieve our intended appearance, set your browser's zoom level to 120% (125% for Internet Explorer and Google Chrome). 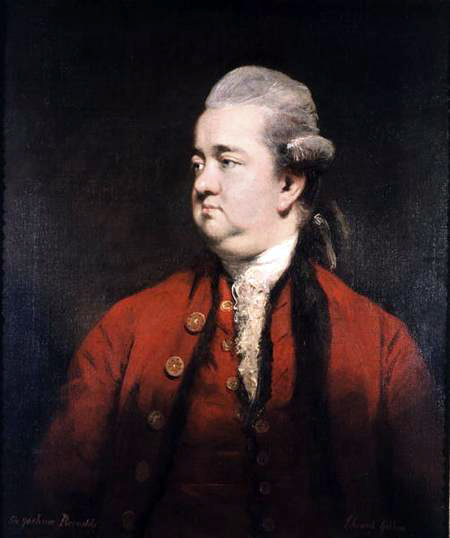 The field of Edward Gibbon Studies, academically a sub-field of British History and of English Literature, is populated by a superbly talented international cast of scholars led by two of its most accomplished: J.G.A. (John) Pocock, Professor of History Emeritus at Johns Hopkins University, author of the highly acclaimed series on Gibbon, Barbarism and Religion; and David Womersley, Professor of English Literature at Oxford University. He is responsible for giving Gibbon students in 1994 the now definitive edition of the Decline and Fall and for an abundance of other valuable work, all elegantly and masterfully crafted. No one from any perspective should presume that one outdistances the other. In point of fact, the two scholars are simply approaching Gibbon Studies from different (though if they would have it, allied) professional disciplines, consequently employing differing sets of concerns and priorities. a 'great melody' like that which Yeats found in Burke. (Pocock's Work on Gibbon page) …the debt of all Gibbonian scholars to David Womersley is not only inexhaustible but increasing." (B&R v.3) You'll want to visit our Womersley page for a complete listing of his work, and then go to our Scholars page for information on others who have worked and continue to work in the field. Pocock receives a degree of special attention here because his The Machiavellian Moment: Florentine Political Thought and the Atlantic Republican Tradition (Princeton, 1975) was our original inspiration to undertake more advanced work in both historical studies generally and later in Gibbon Studies specifically. But note well, our approach is categorically non-sycophantic; you'll find nothing here to indicate any degree of obsequious glad-handing. Now in his tenth decade, Pocock has entered his eighth decade of publication, a remarkable professional achievement. Visit his page for much more. Check back frequently for updates. We hope you find the site useful and easy to work with. Our site is W3C–validated HTML5 and CSS 3. Image at uppermost right is the flag (albeit anachronistic) of Lausanne, capital of Canton de Vaud, Switzerland, emblematic of Gibbon's three periods of residence in and warm affection for his adopted second country, "a country which I have known and loved from my early youth. Under a mild government, amidst a beauteous landskip [landscape], in a life of leisure and independence, and among a people of easy and elegant manners…" (Preface to vols. 4,5,6 HDFRE in DF, vol. 2, p. 520). *From EG's appraisal of the value of his militia experience, "…and the Captain of the Hampshire grenadiers (the reader may smile) has not been useless to the historian of the Roman Empire." (Autobiographies, "B", p. 190.) Oil on canvas portrait (1779) by Sir Joshua Reynolds (1723-92): private collection.